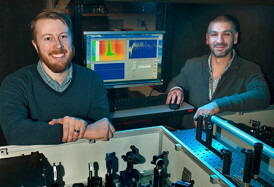 Postdoctoral fellow Erik Busby and Matt Sfeir with optical equipment they used to study charge carrier production in organic photovoltaic polymers at Brookhaven Lab's Center for Functional Nanomaterials. One challenge in improving the efficiency of solar cells is that some of the absorbed light energy is lost as heat. So scientists have been looking to design materials that can convert more of that energy into useful electricity. Now a team from the U.S. Department of Energy's Brookhaven National Laboratory and Columbia University has paired up polymers that recover some of that lost energy by producing two electrical charge carriers per unit of light instead of the usual one. "Critically, we show how this multiplication process can be made efficient on a single molecular polymer chain," said physicist Matthew Sfeir, who led the research at Brookhaven Lab's Center for Functional Nanomaterials (CFN, http://www.bnl.gov/cfn/), a DOE Office of Science User Facility. Having the two charges on the same molecule means the light-absorbing, energy-producing materials don't have to be arrayed as perfect crystals to produce extra electrical charges. Instead, the self-contained materials work efficiently when dissolved in liquids, which opens the way for a wide range of industrial scale manufacturing processes, including "printing" solar-energy-producing material like ink. The concept of producing two charges from one unit of light is called "singlet fission." (Think of the fission that splits a single biological cell into two when cells multiply.) Devices based on this multiplication concept have the potential to break through the upper limit on the efficiency of so-called single junction solar cells, which is currently around 34 percent. The challenges go beyond doubling the electrical output of the solar cell materials, because these materials must be incorporated into actual current-producing devices. But the hope is that the more-efficient current-generating materials could be added on to existing solar cell materials and device structures, or spark new types of solar cell designs. Producing the twin charges on a single polymer molecule, in contrast, results in a material that's compatible with a much wider variety of industrial processes. "We expect a significant leap in the development of third-generation, hot-carrier solar cells," said Campos. "This approach is especially promising because the materials' design is modular and amenable to current synthetic strategies that are being explored in second-generation organic solar cells." "We put light energy into a material with a laser pulse and watch what happens to that energy using a series of weaker light pulses - somewhat analogous to taking snapshots using a camera with a very fast shutter," Sfeir said. The team also studied the same process using "pulse radiolysis" in collaboration with John Miller, who runs the Laser-Electron Accelerator Facility. "The differences observed between these two experiments allowed us to unambiguously identify singlet fission as the primary process responsible for the production of these twin charges," Sfeir said. "The ideas for this project and supervision of the work were really shared between Brookhaven and Columbia," Sfeir said. "It's a great example of the kind of collaborative work that takes place at DOE user facilities like the CFN." The next steps for the CFN-Columbia team will be to test a large class of materials using the design framework they've identified, and then integrate some of these carbon-based polymer materials into functioning solar cells. "Even though we have demonstrated the concept of multiplication in single molecules, the next challenge is to show we can harness the extra excitations in an operating device. This may be in conventional bulk type solar cells, or in third-generation concepts based on other inorganic (non-carbon) nanomaterials. The dream is to build hot-carrier solar cells that could be fully assembled using solution processing of our organic singlet fission materials." Visit Brookhaven Lab's electronic newsroom for links, news archives, graphics, and more at www.bnl.gov/newsroom, follow Brookhaven Lab on Twitter, twitter.com/BrookhavenLab, or find us on Facebook, www.facebook.com/BrookhavenLab/.